We recently offered Burmese whole dried chiles, and now we have a brand new shipment of the same variety, ground as shown. The chile pepper known as "Ka-Leang" in Thailand is a variety from Burma, and known to be extremely potent. Just touch one of these to your lips and feel the burning heat instantly. For people who like their food "really really spicy" this is about as good as it gets. 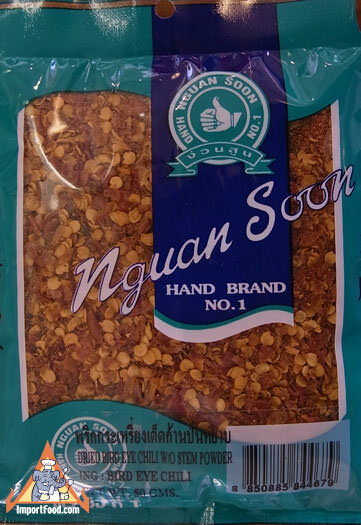 It is generally thought that these Ka-Leang peppers are double the heat of already-spicy Thai prik-ki-nu. We especially like this in Lao-style "Pra Neua" larb. This is fresh pack, literallly dried and packaged less than 8 weeks ago by prestigious "Hand Brand". Excellent quality overall. Ka-Leang are an ethnic group numbering over 3 million people in Burma and along the Thai-Burmese border in Kanchanaburi. Known in English as "Karen" people. One package is about two handfulls. Make Your Own Ground Thai Chiles, From Scratch. Over the years we've sold thousands of packages of whole dried chiles to chefs who insist on making their own chiles powder. 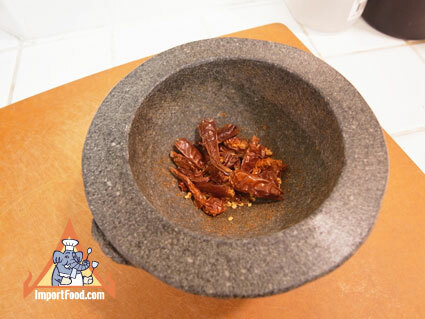 It's quick, easy, and results in a fresher chile powder with homemade rustic flavor. Be careful not to prepare too many at once, if you put a big handful into your skillet at once, it creates pepper vapors that overwhelm your kitchen. We recommend preparing just 10 chiles at a time, which yields about a tablespoon of coarse ground chiles. 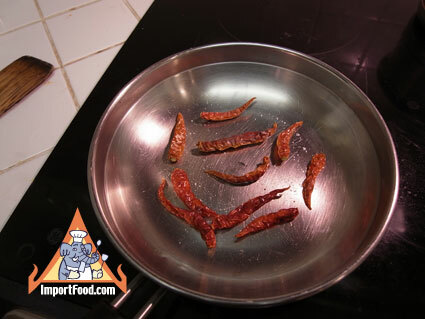 Start by putting 10 chiles into your skillet, over low heat (the lowest setting). Leave your chiles alone for about 5 minutes then flip over. After a few more minutes, you'll notice some chile aromas coming out. 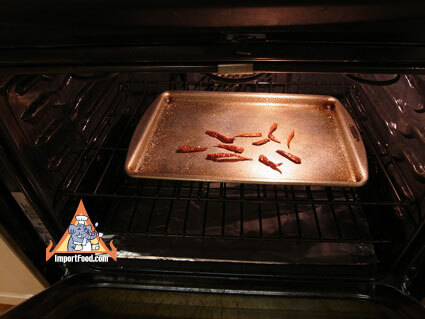 Remove from heat and set aside for a few minutes to cool. Now your chiles are ready to crush. If using an oven, place on a cookie sheet and bake at 260 degrees F for 10 minutes, flipping the chiles over, halfway through. Chinese-style food is popular in Thailand, often the best hotels in Thailand have wonderful Chinese food. We've created this Thai-style Chinese szechuan chicken recipe using the rare szechuan peppercorn together with very hot whole dried chiles. It's cooked using alcohol, and we were lucky enough to have a bottle of Laotian whisky distilled from sticky rice, but you can use Wild Turkey Kentucky bourbon with good results. The result is fairly spicy, so this isn't for people who don't like spicy. Something we love about this is the way the Szechuan peppercorn make your tongue tingle. It's also tastes great a day later, as a leftover reheated. We are pleased to present this recipe which nicely blends two of our favorite ingredients: coconut milk and rice, in a main course. Typically you find coconut milk and rice cooked together as a dessert such as inkhao neeo dahm (black sticky rice) or sticky rice with mango. This recipe prepares two generous servings, feel free to make a larger batch. We used a large skillet, as shown, it doesn't need to be prepared in a wok. We used a quick home-made vegetable broth (sliced veggies in water with a bit salt and pepper, simmered for an hour). 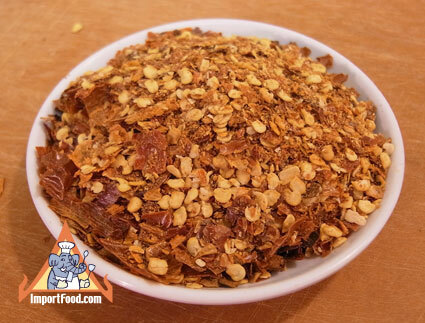 It's pleasantly just a tad spicy, we added hand-crushed whole dried Thai chiles. Feel free to add more or less to suit your taste. It's a delicious vegetarian recipe that everyone should enjoy.